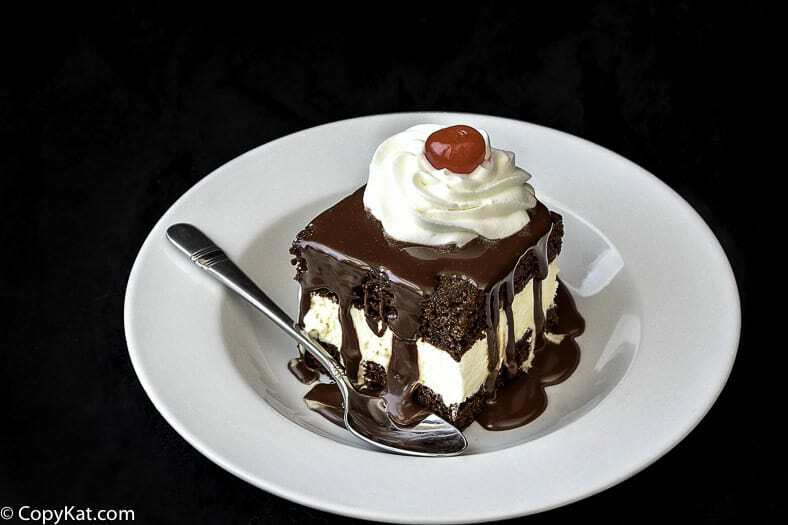 Shoney’s Hot Fudge Cake is a dessert that has ice cream sandwiched between devil food cake. Shoney’s and Bob’s Big Boy aren’t around as much as they used to be, but you can make this menu item at home. When I was growing up, I would spend large parts of my summer in Jefferson City, Missouri. My grandparents loved eating at Shoney’s and I did too. They had two dessert items you had to try, one was the Shoney’s Strawberry Pie, and the other must try dessert was the Hot Fudge Cake. Thanks to Jenny Field of the Online Pastry Chef, you can check out this recipe as well. Who doesn’t remember this glorious dessert from Shoney’s Big Boy (or Bob’s Big Boy)? The iconic hot fudge cake was many a suburban kid’s birthday dessert. It’s retro vibe and the irresistible combination of moist devil’s food cake, creamy vanilla ice cream, thick and rich hot fudge sauce and billowy whipped cream is not to be missed, even if you’ve never tried it before. And don’t forget the cherry on top! 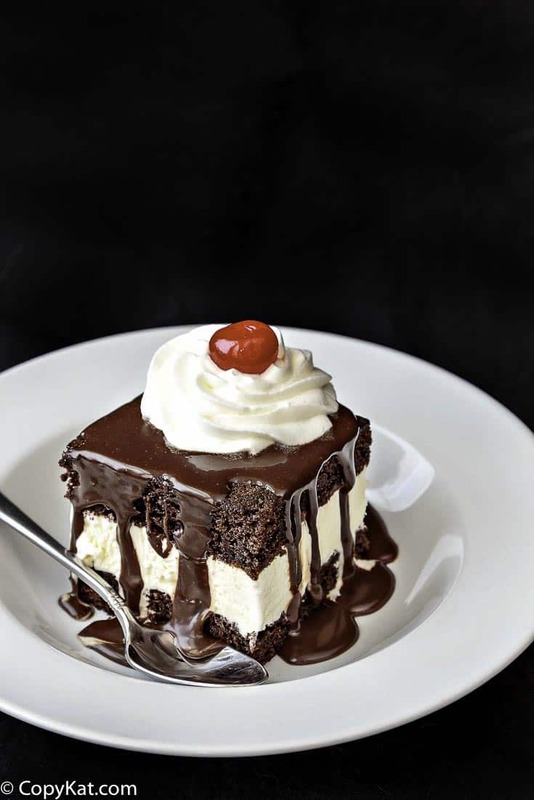 And don’t forget National FREE Hot Fudge Cake Day at Shoney’s! Last year, it was December 6th, so keep your eye on the calendar for when you can enjoy this treat free. Until then, make and enjoy this CopyKat version whenever the mood strikes! Note: This recipe only uses half the sheet cake, so either make 2 hot fudge cakes to use all the cake, or save the other half for another use. Regardless, it will be easier to assemble the cake if you work with half at a time. If you decide to make the whole cake into fudge cake, you will have enough fudge sauce for all the slices, but you will need to get 2 containers of ice cream, of which you will probably use about 1 1⁄2. You can make your own Shoney's Hot Fudge Cake at home. For the CakeHeat the oven to 350F. Grease a 9”x13” metal cake pan (Don’t use glass, because you want the cake to have straight sides) Line the bottom of the pan with parchment, and spray lightly. Set aside.Combine cake mix and the rest of the cake ingredients in a large bowl. With a hand mixer, mix on low speed for about 30 seconds. Scrape the bowl. Mix on medium speed for 2 minutes, scraping bowl as necessary.Pour into the prepared pan and smooth the batter. Bake for 22-25 minutes or until cake springs back when pressed lightly and the cake starts to shrink away from the sides of the pan.Remove to a rack to cool for 10 minutes. Then turn out onto a cooling rack. Peel off the parchment and let the cake cool completely. To Make the Fudge Sauce Combine all ingredients except vanilla in a heavy-bottomed saucepan. Heat on medium heat, stirring constantly until all the chocolate has melted. Stir in the vanilla after you have removed the pan from the stove. This way the vanilla will not evaporate. Keep warm (or reheat) for serving. Makes a generous 2 cups of sauce. To Assemble Level the top of the cake if necessary with a knife. You want the cake pieces to have the same thickness so it looks uniform when served. Carefully slice the cake in half horizontally. Leave the halves in place. Each half should be about 3/4 inch thick. Cut the cake in half, short-wise. You will end up with 4 rectangles of cake, each about 9” x 6”. Set half the cake aside (for another use or to repeat the assembly process depending on how much hot fudge cake you want) Spread 2 long, overlapping sheets of plastic wrap on the counter. Place the bottom rectangle of cake on the wrap. Peel off the cardboard from around the ice cream. Slice the ice cream into 3⁄4” slices and arrange them, touching, on top of the cake layer. You will have to trim some to fit. You will probably not use all the ice cream, so put the leftover portion in a freezer container to eat later. Place the second rectangle of cake on top of the ice cream and press down lightly. Wrap the cake in the plastic wrap and freeze for at least 2 hours. To Serve Slice the Cake into 6 squares, each approximately 2” per side. Pour some of the fudge sauce over, top with whipped cream and a cherry. Wow, this cake was great. My family of four gobbled this up last night. Smiles all around. My sis worked at Shoney’s for years. They thinned the hot fudge with premade coffee, which was necessary often. That is party of the flavor most people’s have experienced. I would add it to the recipe. That’s a great addition and makes a lot of sense to underscore the chocolate flavor! I knew there was something missing – that’s a great tip!! 🙂 Thanks! This was a much desired and rarely ever had dessert from my childhood. Just a note on this recipe…ice cream hardly ever comes in those cartons any more! I’ve been making this dessert for YEARS and have found that I can either form the ice cream in a pan using parchment for easy take out and then lay on cake layer OR if in a hurry, I just use ice cream sandwiches and lay them out on the cake layer. Not quite the same, but in a hurry, it works. You absolutely can use your favorite store bought fudge sauce. Enjoy! Thanks Stephanie…you have given me a great idea for our monthly luncheon. Might try this with other flavors of cake and ice cream. Cherry comes to mind since cherries are in season and plentiful right now. You always get me rave reviews when I use your recipes.